In order to achieve meaningful climate protection goals, it is essential that we take a holistic view of energy consumption across a number of sectors, including electricity use, heat generation and transport. The aim is to promote the use of green electricity and accelerate the take-up of energy-efficient technologies, and thus reduce fossil energy consumption, by linking these sectors to an smart management system. Energy-consuming applications in buildings can already be networked and automated to regulate and monitor their consumption and increase energy efficiency. But energy management can now also be used in a number of other fields, including photovoltaic systems for self-generation and, in the future, charging stations for electromobility. There are huge amounts of energy to be managed in all of these fields. This makes the coordinated coupling and optimisation of the individual energy sectors increasingly important for climate protection. The technical prerequisites to network the energy sectors have already been met. The technical jargon uses the terms “sector coupling” or “Integrated Energy”. With KNX IoT, these “smart energy systems” can be installed in buildings. KNX installations connect all energy-consuming applications, including electricity consumers, power generators, heating, air conditioning and charging stations for electromobility via KNX IP. For example, solar power generation, flexible charging processes for energy storage systems and load management can all be optimally coordinated. Generation peaks can be stored for later, peak loads avoided and a continuous cost-optimised energy flow achieved. This has been achieved in an ongoing model installation, which couples the various consumers in a smart residential house equipped with a battery buffer to a smart energy management that takes account of the house’s self-generated solar power. Smart homes, for example, may feature one or more controllable charging stations for electric vehicles, as well as the usual household appliances, electric heaters, a heat pump system, a cooling ceiling and a photovoltaic system with an inverter, along with an electric battery storage system fitted with a charge controller. The KNX IoT technology regulates the energy flows to ensure that self-generated solar power is used in a cost-optimised way. Additional energy from the grid is also available, of course. Load management also ensures that the maximum permissible connected load is not exceeded. Depending on the control strategy, the electric vehicle batteries are charged either in an eco-balance-optimised manner or in a cost-optimised manner, using solar power in conjunction with the energy storage system. The charging process is also flexible, taking the vehicle’s life cycle into account to utilise peaks in energy. The individual energy sectors are coupled via Internet protocol, in this case KNX/IP or Modbus/IP interfaces. Data for management logic is provided, among others, by intelligent energy meters, inverters, battery charge controllers, heat pump control and switching actuators with current sensors. The smart energy management can be operated and controlled via KNX visualisation. Building automation with KNX IoT is ready for the transition to green electricity. 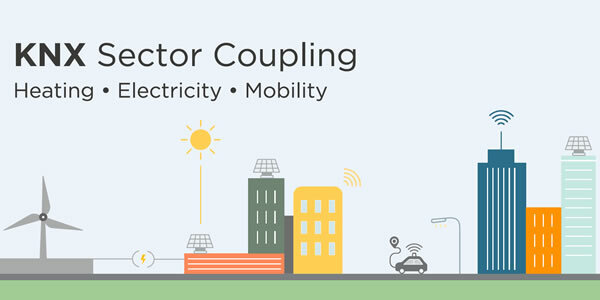 The term “sector coupling” means the networking of sectors of the energy industry that have been considered independent of each other until now: electricity, heat and e-mobility, so that renewable energies can be optimally used and integrated. This concept entails support for a holistic energy transition away from fossil fuels to renewable energy sources. Additionally, smart coupling can promote the use of energy-efficient technologies, reduce overall energy consumption and offset fluctuations in electricity demand and wind and solar energy generation. Sector coupling uses energy management to support the desired climate protection goals.